French bulldogs are funny little buggers. Can't swim, hate flying, but love "talking". They've got personalities that run the gamut. Hyperactive Frenchies are just as common as total couch potatoes. There’s also a fairly large range of sizes (from 16lbs all the way up to 28lbs). If you’re trying to find the best food for your French bulldog, that can be a lot to calculate. For now, we can give you some answers and point you to a few good options that will both satisfy your Frenchie pal and keep him super healthy. We consulted with registered dog handlers and French bulldog experts to figure out exactly what Frenchies need to perform (or loaf around) at their peak. This is a pretty different type of food for us to recommend. We almost always only recommend foods in which the main ingredient is meat. However, French bulldogs a bit different, since they’re prone to puppy farts. The best ways to deal with that are usually to (1) include more fiber in your dog’s diet and (2) buy food with fewer commercial fillers. This recipe does both. The main ingredients are brown rice and white rice, which means there are plenty of carbs and plenty of fiber. And that’s okay, since most Frenchies don’t burn too much energy. The protein comes from mostly from chicken meal, and the formula gets the rest of its nutrients from veggies. All in all, if your French bulldog has a rather typical farting problem, try a food like this. It also makes it a good food for beagles. 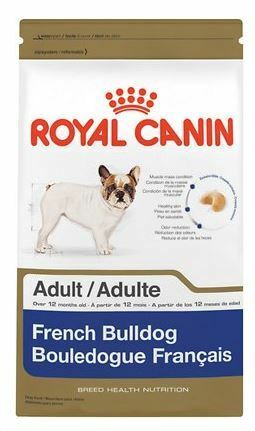 This is a good option for French bulldogs with thyroid problems. Four of the five main ingredients are protein sources: chicken, chicken meal, egg product and potato protein (the fifth ingredient is peas if you were wondering). That much protein gives it a much better nutrition profile if your Frenchie is trying to drop a few pounds. We also like that lots of the protein comes directly from muscle meat (salmon is also an ingredient), since we generally recommend to find dog food with as many whole ingredients as possible. There are also plenty of fruits and veggies in here, which we always like to see, since they provide lots of nutrients naturally. The one thing we’d really like to see more of here is fiber (again, for those smelly episodes). 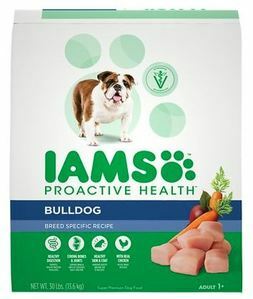 But overall, this is a very good dog food, and it’s an absolutely fantastic option for French bulldogs with thyroid problems. This is one of the few foods out there designed specifically with French bulldogs in mind. 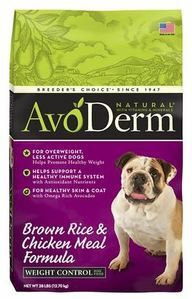 Like the AvoDerm recipe, the main ingredient in this dog food is brown rice, and it’s for the same reason: fiber helps with upset tummies. All of the protein comes from chicken or chicken meal, and there are plenty of sources of good fats, including salmon oil, which provides those nice omegas. This particular formula could stand to include some more fruits and veggies, which is something to keep in mind (and it’s why we didn’t put it at the top of our list), but you can always supplement those yourself. 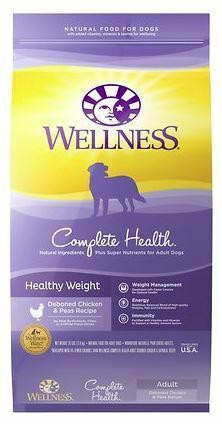 Wellness brand’s weight-loss recipe is another great option for pudgier Frenchies. It does a lot of the things the Premium Edge recipe (above) does, but it also includes enough fiber to help your dog’s digestion and curb his little toots. This food has fewer calories, and it mostly achieves that by reducing the amount of fat, so be careful if your dog has a brittle coat; this might not provide enough omega-rich fats. For most dogs, though, that shouldn’t be a problem. We also really like the variety of proteins in this dog food. You’ll find protein from chicken, chicken meal, and whitefish. Finally, like all Wellness products, there are loads of great fruits and veggies, which is one of the reasons we always end up recommending them to you. 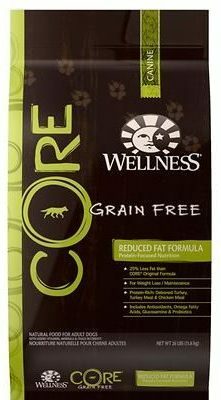 We’re wrapping up our list with a product we’ve recommend a few times before: Wellness Core Dry Dog Reduced Fat Formula. This is a lot like the other Wellness recipe mentioned above, but the protein mostly comes from turkey instead of chicken, and it includes a few more antioxidant-rich fruits and veggies. The benefits are mostly the same, though: lots of great protein, lots of fruits and veggies, and plenty of good fats. And when it comes right down to it, those are pretty much all the things you’re looking for in a good dog food for weight control. What did our dog think? She thought it tasted great! The amount of food your Frenchie needs to eat depends on a lot of factors, including age, weight, activity level, and metabolism. For small or inactive dogs, a good rule of thumb is to feed him about 25 calories per pound of bodyweight. Average dogs need about 30 calories per pound of bodyweight. And for bigger, active Frenchies, you can increase it as much as you need to maintain his weight—but it’ll usually be between 33 and 35 calories per pound. However, even though some dogs can be hyperactive, this breed usually doesn’t need much exercise. It should be pretty rare to feed your pup more than 30 calories per pound of bodyweight, and many dogs will be able to maintain their weight at 25 calories per pound. Like with most dogs, you’ll need to take a trip to your vet to figure out if your little buddy is underweight, overweight, or juuuust right. Then, set some goals accordingly. Just remember that every dog is different, and your vet will be able to set goals for your specific dog a lot better than we can. These numbers are just a guide. We always recommend dog foods in which protein from various, high-quality meat sources is the main ingredient. That said, your French bulldog probably doesn’t need as much protein as, say, an active lab. 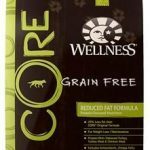 Still, try to adhere to our gold rule of dog food and look for options with 25% protein or better. Carbohydrates should come mostly from complex plant sources if you can find them—this mostly means sweet potatoes. 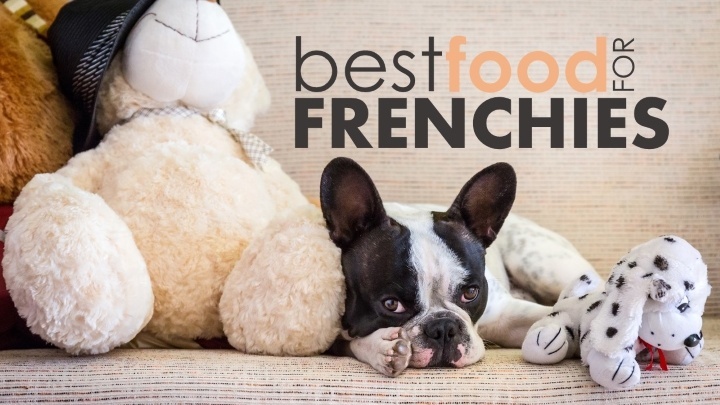 Frenchies are prone to several different health problems, so they don’t do well with corn and soy, and some will have a tough time digesting grains. French bulldogs have a short, coat, so finding super-omega-rich fat sources won’t be as vitally important as it would for a long-haired dog. However, with too little fat, Frenchies sometimes develop dry, brittle fur, which is a major sign of malnourishment. So, we want at least 5% fat, if not more. Allergies. Achoo! Your French bulldog probably has more allergies than you. This breed is prone to them, so ty to avoid foods that make it worse, like corn or soy. If your pup’s allergies are particularly bad, try cutting out grains. Farting. Yep. Frenchies fart. Some French bulldogs fart quite a bit. In a lot of cases, your pup’s toots are probably cause by the weird, low-quality fillers found in most commercial dog foods. Opting for a food with simpler, more natural, higher quality ingredients usually does the trick, and it’s even better if you can add a little fiber. You should probably stay away from corn, too. Hypothyroidism. Hypothyroidism is a condition that prevents the thyroid gland from producing enough hormones. This is especially common in the French bulldog breed, and it can cause them to gain weight really easily. So it’s possible that your little buddy might need to go on a doggy diet high in protein and low in simple carbs. On the hunt for more info? Check out this article on good dog foods for Maltese pups. And here's a good guide for feeding a Shih Tzu.